Every December, Miami Beach plays welcoming host to one of the biggest contemporary art parties of the year. Art Basel Miami is North America’s sister event to Art Basel Switzerland, inaugurated in 1970. Launched in 2002, the Miami event has since surpassed its European counterpart in scope, reputation and magnitude. Four days, 33 countries, 250 galleries, over 2,000 artists and a veritable overload of the senses is only part of the story. Private collectors, curators, buyers and art freaks flood the city, choosing carefully from a huge variety of parties, openings, galas and art talks. Art Basel is a visual trove of talent both raw and renowned; when you arrive you don’t just sidle up, you dive in. For those lucky enough to join in the festivities, here’s a list of must-see events, shows, artists and art deco buildings to get you started. In 2008, Scion hosted “Installation 5: Self Portraits” in the penthouse suite of the Raleigh Hotel in South Beach. Built in 1940, this boutique hotel oozes iconic chic and sits right on the oceanfront, so views from the penthouse balcony are amazing, even by South Beach standards. Scion’s national art tour benefits charities and non-profits that support independent artistic expression. “Installation 5” featured a wish-list of established and emerging artists including, Yoskay Yamamoto, Edwin Ushiro, Jeff Soto, Kelsey Brookes, Blek le Rat and Ron English. Composer, Mark Mothersbaugh, (of Wes Anderson film fame) made his contribution with a nerdy, lime rug portrait of himself. The Gen Art Vanguard Opening Night Gala takes place in the Wynwood Arts District where hip, eccentric youngsters vie for the attention of other hip, eccentric youngsters. Over 70 different galleries, museums and galleries converge with Miami’s Fashion and Design Districts in Wynwood. The party should be in full, hectic swing by 9 p.m. In 2008, nearly 3,000 guests including Venus Williams and Todd Oldham were treated to an outdoor performance by Graffiti Research Lab, a live-action painting session, cocktails served by leggy synchronized swimmers around an indoor pool, and a huge hall teeming with art. The Aqua Hotel on Collins Avenue in South Beach is another art deco staple. The boutique hotel has two floors of rooms surrounding a verdant courtyard and small spa. For Art Basel, each room is converted into individual gallery-microcosms, with paintings, sculpture, photographs and mixed-media works lining the walls, or occasionally propped on beds. 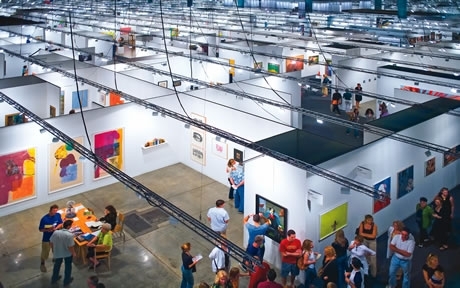 In 2009, the Pulse Contemporary Art Fair switched venues from Soho Studios to Miami’s Ice Palace, allowing for expanded gallery space and daily outdoor concerts including sets by The Vivian Girls and The Blow. Known for being both experimental and established, large-scale sculpture and installations took up the remainder of space in the fair’s exhibition halls and lawn. After long nights of schmoozing, partying and gazing at art, a lazy afternoon amble through Lummus Park provides a good breather before braving the Convention Center for the main event. A labyrinth of art, sculpture, digital media, foreign languages, quirky installations and swanky art lounges abound. For the 2009 show, the main exhibit floor was redesigned to include a new 40,000-square-foot temporary exhibit on the sand.